This award-winning book answers some of the big questions on the legitimacy of the European Union. Specifically, it looks at what it would mean for the EU to be considered a legitimate body and where our ideas on this question come from. The Struggle for EU Legitimacy traces the history of constructions and contestations of the EU's legitimacy, in discourses of the European institutions and in public debate. 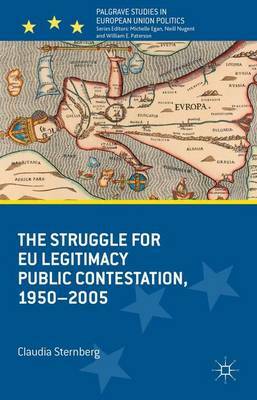 Through an interpretive, non-quantitative textual analysis of an eclectic range of sources, it examines both long-term patterns in EU-official discourses and their reception in member-state public spheres, specifically in the German and French debates on the Maastricht and Constitutional Draft Treaties. The story told portrays the history of legitimating the EU as a continuous contest over the ends and goals of integration, as well as a balancing act-which was inescapable given the nature of the integration project-between 'bringing the people in' and 'keeping them out'. In addition, it was a balancing act between actively politicizing and deliberately de-politicizing the stakes of EU politics.